Image by Victoria Pickering licensed under Creative Commons. This article was first published on February 9, 2011. We're running it again because it's still interesting! Chinatown originally developed in the late 19th century around Pennsylvania Avenue NW at 4½ Street (now John Marshall Place). Chinese immigrants to the US in those days faced discrimination and downright hostility; the creation of Chinatowns in Washington and elsewhere in the country was as much a defense mechanism as anything else. Chinatowns provided safe havens where new immigrants could find shelter, sustenance, and employment. 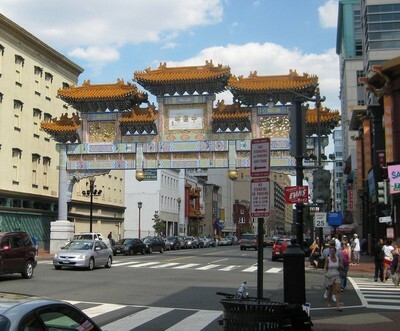 Washington’s original Chinatown was forcibly disbanded in 1931 when the land was taken over by the government for the Federal Triangle and other municipal projects. A new Chinatown was soon established (against the wishes of local businesses and landowners) along H Street NW between 5th and 7th streets. After a welcoming banquet that included fish stomach and beef tendon soup, Barry went on to participate in a ceremony establishing Washington and Beijing as sister cities. 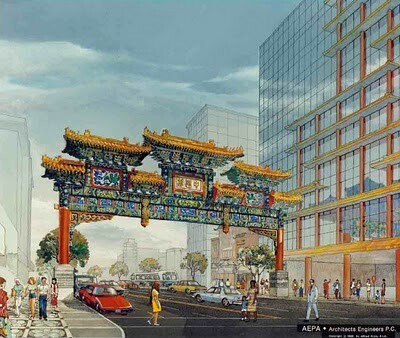 As part of the agreement, the two cities would work together on a project to build a traditional archway in Washington’s Chinatown. The Beijing Ancient Architectural Construction Corporation was in charge of work in China, including fabrication of the 59 intricate dou gong supports. These are complex, cantilevered contraptions of carved wooden brackets, balanced and interlocked with tenons and mortises rather than nails or screws and providing a sturdy and resilient support for the gracefully curved roofs. The dou gongs have a very festive appearance, almost like frilly Victorian bloomers peeking out from beneath the golden skirts of the roofs. 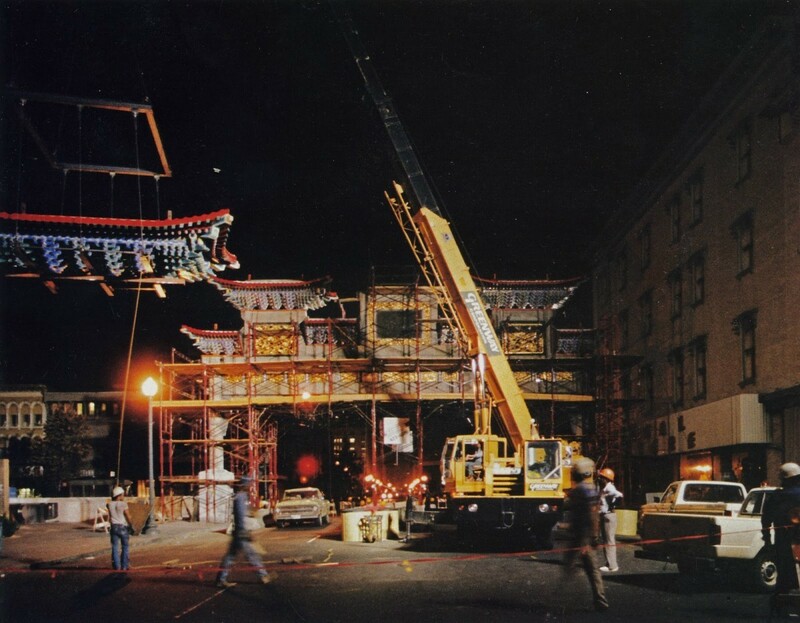 The arch was constructed over a seven-month period, much of the work needing to be done at night so as not to block traffic on busy H Street. The finished monument was officially dedicated in November 1986. Sure enough, on that same evening Mayor Marion Barry took to the airwaves to announce that he would be stepping down when his term ended and not running again in the fall elections, as he had been planning. Barry had been arrested at the Vista Hotel in a sting operation in January; he would be found guilty of one charge of possession of cocaine and sentenced to a six-month prison term. The archway in 2008, before restoration. In addition, a new lighting system was installed, using advanced, energy-efficient LED lights. The brilliant, vivid archway is now at the center of one of downtown’s liveliest neighborhoods, and its bright colors now compete with lively shops, restaurants, and outdoor video displays. Invaluable assistance for this article was provided by Mr. Alfred H. Liu, A.I.A., President of AEPA Architects Engineers, P.C. Other sources included Asian Voice, Friendship Archway Inauguration Edition (Nov. 1986); Francine Curro Cary, ed., Urban Odyssey: A Multicultural History of Washington, D.C. (1996); James M. Goode, Washington Sculpture (2008); and numerous newspaper articles. This article was cross-posted at Streets Of Washington.